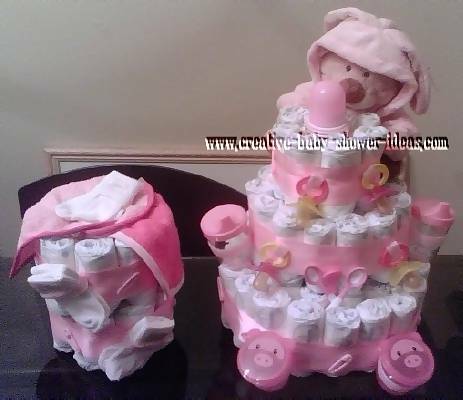 Welcome to our diaper cake gallery, full of diaper cake instructions and photos shared by our readers. Use the great ideas and tips to make your own cake! For more categories, click on the index below. Happy Viewing! Cathy B. from Washington, D.C. I purchased a small pack of Pampers Stage 1 Swaddlers. 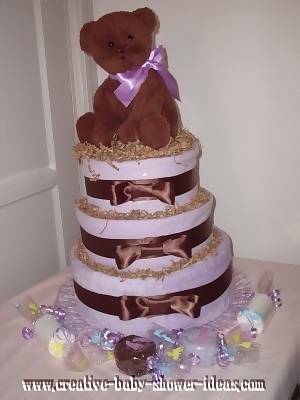 I used cake boards, glue dots, ribbon and ruffles to make the cake fancier. Also attached are receiving blankets, pacifiers, infant spoons, hats, teething ring, rattles and sleepers. 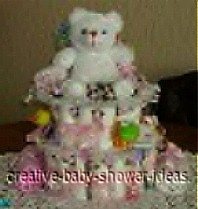 It's topped with a White Teddy Bear which is being supported by a container of Johnsons Baby Powder. 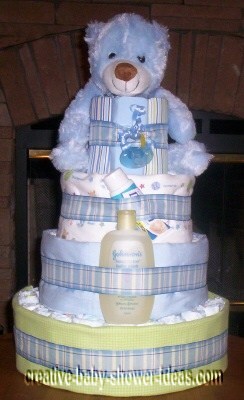 I made this diaper cake for a friend who was expecting a boy. I started out with some buttery cream colored onesies for my inspiration. I used baby wash as the center to hold the cake together. 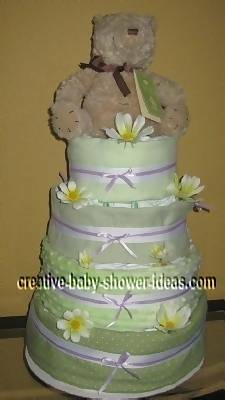 I was originally heading towards an elegant diaper cake, but came across an adorable teddy bear that giggles when you squeeze its toes. It was so cute I couldn't resist! I rolled a summer blanket to look like a rose and ran it through the middle of the cake. I wrapped the bottom two layers with a sparkly gold ribbon. The top layer I tied white tulle around. 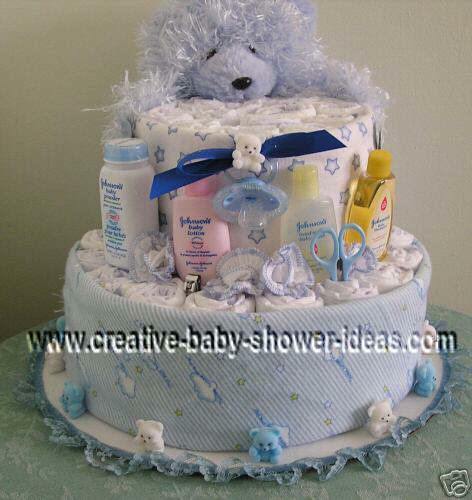 I finished it off with clear shred to cover the diapers and give a touch of elegance. She loved it! 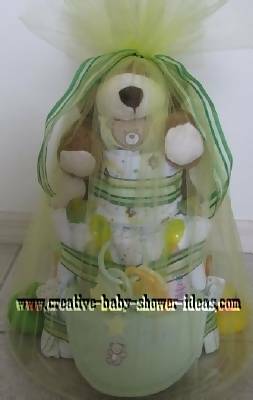 This kitty in a basket diaper cake has 1 oval wire basket,14 diapers, 1 baby oil, 1 baby Cream, 1 Wash Cloth, 1 teether, 1 bottle and 1 burp cloth. 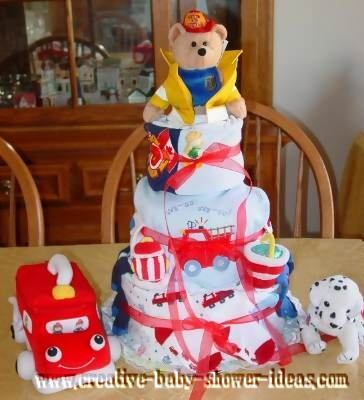 This was ordered for a Baby Shower. 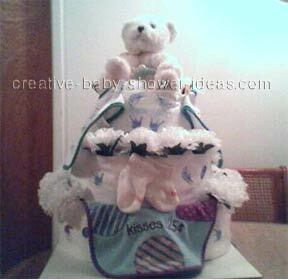 I used size 1 diapers to make this diaper cake. First I wrapped a few diapers around a baby bottle that I filled with peppermints for mom for the top layer. Then I made the 2nd layer and a 3 layer, each layer is bigger than the first. 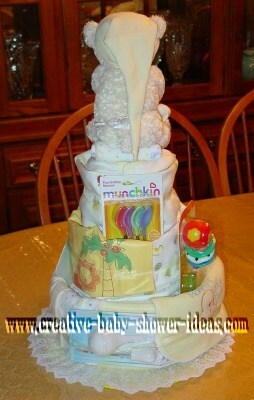 Then comes the fun part, I took all kinds of baby items and attached them all over the cake. 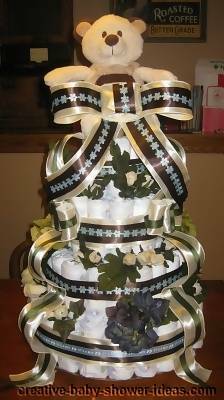 I use a lot of ribbon and just have fun with it. I always use receiving blankets to wrap around the 2 and 3 layer and then the top layer. I use a bib to wrap it up. I always try to put a cute little stuffed animal on top as well. All of my friends that I have made one for love them. Oh and to finish it off, I get that sheer see through material and wrap it all up in it! They are so much fun to make! 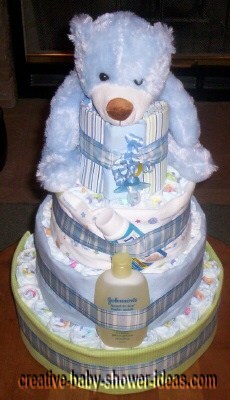 The first attempt at a diaper cake, and I think it turned out so cute! It has around 70 size two and three diapers. Very fun! 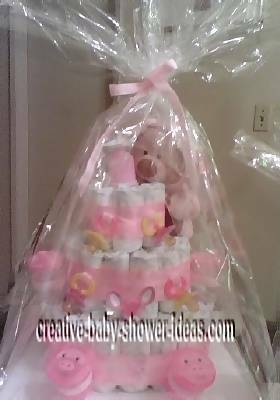 I made a diaper cake for my friend's baby shower. She was pleasantly surprised. Inside the whole the cake I used baby bottles. It was my first one created for a boy. I used 2 packages of the size 1 diapers. The cake received many compliments. I now will make them as baby shower gifts. Thanks for keeping a fantastic creative website! 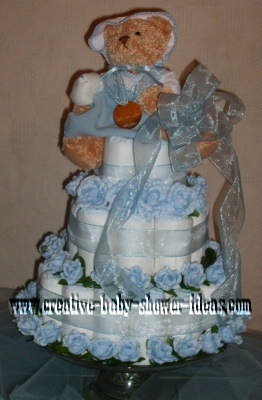 This is a cake I made for a lady at work for a baby boy. 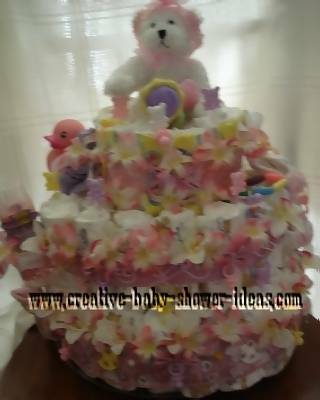 This is a diaper cake I made after looking at your website for ideas. Thank you for the suggestions! 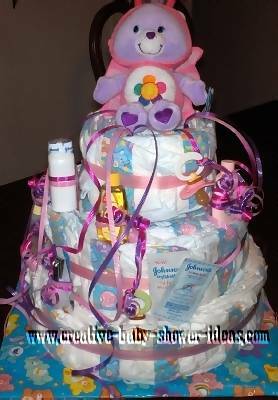 I used a box of wipes as the base (the second tier covers most of the box) and hot glued a tube of diaper rash cream in a box to the top for stability for the second and top tiers. My almost-two-year-old son LOVED helping me roll diapers and keeps asking to roll more! 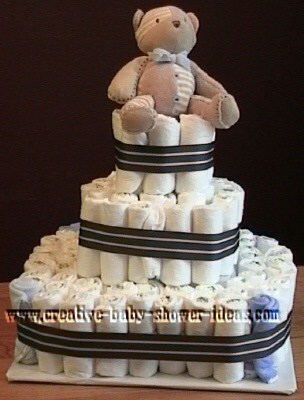 I used regular rubber bands (size 16) to roll the diapers. 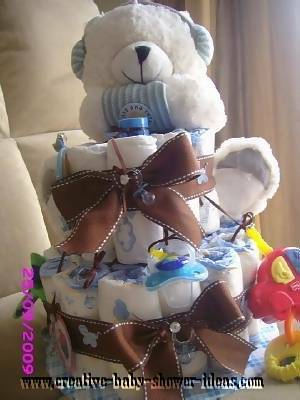 I tried ribbon, but it was a pain and I remembered not enjoying taking the diapers apart when I received a diaper cake myself. They are so much fun to make. I love them. 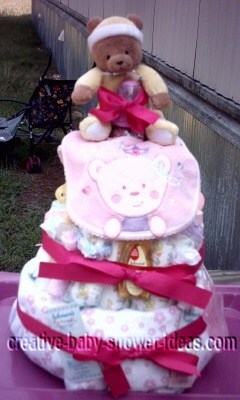 Jodi shared a cute teddy bear cake she made. She had an interesting way of making it! She rolled up a bunch of diapers and laid them flat on her table. Then she laid tape across all of the diapers in a row and picked them all up as a single row. Then she attached the ends together to make a circle and stapled the tape together. Then she would go back in and pull out random diapers to replace with baby items. 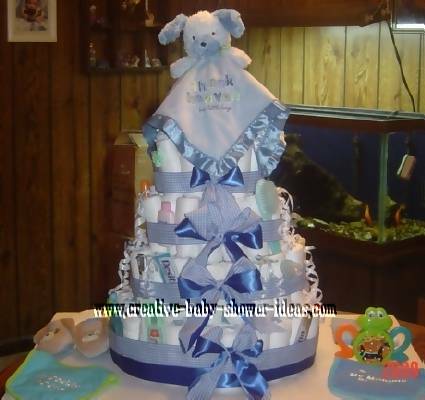 Once all three tiers were finished, she tied them with a sheer blue polka dot ribbon. Then she filled it in with even more baby items. Lucky mom! To finish it off, she placed a matching teddy bear at the top. Cute! 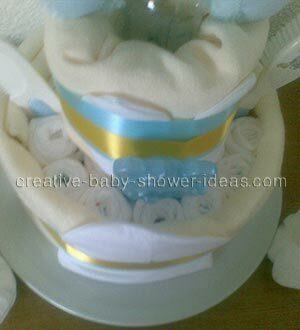 (1) Starting with the newborn diapers, start rolling each diaper and securing with a rubber band. 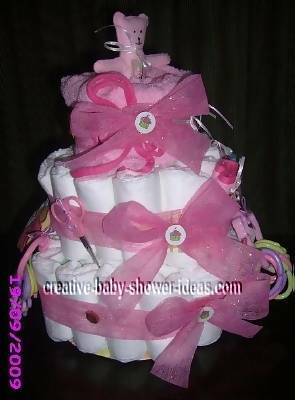 (2) Find a sturdy piece of cardboard and center baby bottle; start stacking the rolled diapers in a circular pattern. Start with an immediate stacking around baby bottle and secure with a piece of yarn on the OD. Then, create a second round (also securing with yarn) and ending with a third layer also securing with a piece of yarn. This is the first tie of the cake. You may want to tuck little odds and ends of baby supplies into this layer. 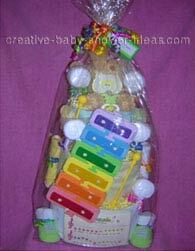 Some examples of what can be tucked are baby spoons, plastic dirty diaper bags, diaper pins, baby bibs etc. 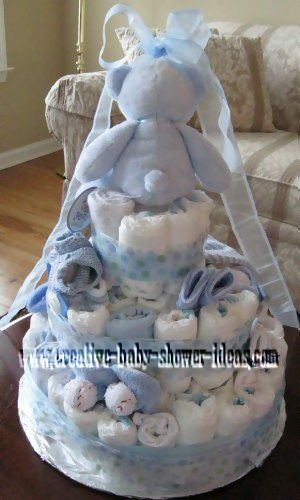 (3) On the second tier, take a receiving blanket or baby bath towel. Fold to match the height of diapers and roll around baby bottle and secure with a safety or diaper pin. After securing, start a layer of stacked baby diapers and secure with a piece of yarn. (4) Now you are on the third and final tier. 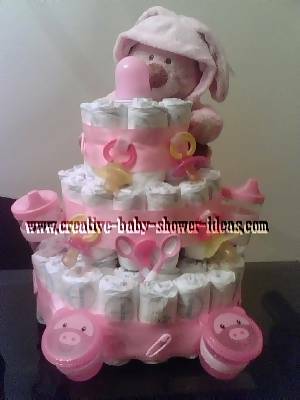 Finish by stacking a layer of diapers which number between 6 and 8 diapers. You will again secure with a string of yarn. Now the decisions begin. You may choose to arrange the diapers so the designed area is on the outside and leave "as is". You can also choose to wrap a receiving blanket around the OD which can be secured with safety or diapers pins. The same holds true for the second and third tiers. I chose to wrap each tier with some plain white fabric which I found on sale at $.50/yard. I also chose not to let the tops of the rolled diapers show so I purchased some white carnations and tucked them into the tops of the rolled diapers in order to hide the diaper. In order to cut down on the number of carnations I used baby bibs and some smaller baby supplies as fillers. 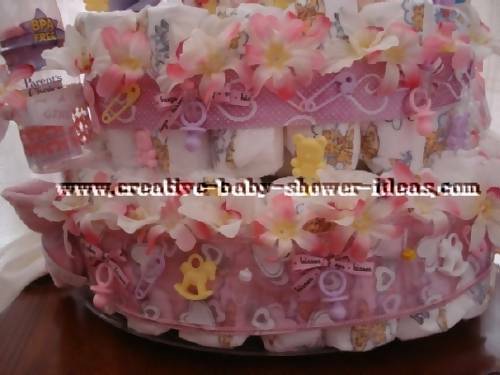 I placed carnations on both the second and third layers as well and used baby supplies as fillers. The top centerpiece of the third layer is your choice. I just happened to choose a stuffed teddy bear. (Ladies: if your hubby or children play those stuffed animal arcade games and bring home stuffed animals by the 100's, this is a good way to get rid of them). The rest of the decorating is whatever you choose. GOOD LUCK !! 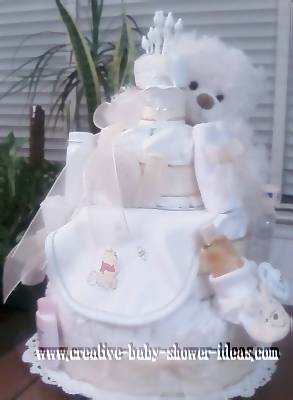 I made this cake for a baby girl with teddy bears which I made by hand with felt, lace, baby blanket and different kinds of favors which rim the bottom. The middle is sparkling grape juice. 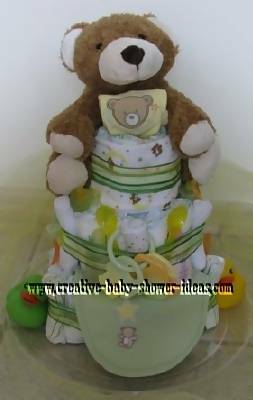 The first two layers have size 1 diapers single rolled with design out and the top layer is swaddlers diapers, design out. The tiers are decorated with valentines ribbon and hot glued for closure in the back. Tiny bows of hugs and kisses decorate the front. 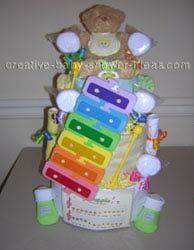 The items are stuck to the caked by having ribbon glued to the ribbon of the cake. The bear on top hides the bottle of grape juice (we don't want the mom on alcohol. Little bottles, rocking horses, baby pins, rattlers are hot glued here and there. Some bears stick out of diapers here and there to keep up the bear theme. 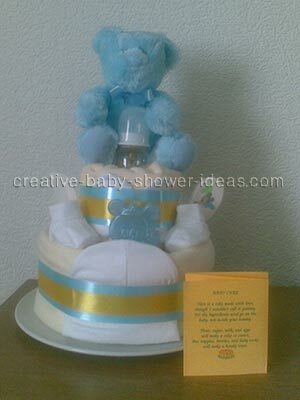 I made one similar to this one for my daughters baby shower and it was such a hit. Now I make them to sell. 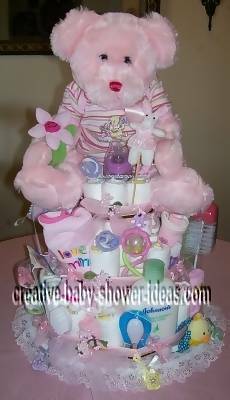 Here is a diaper cake that I made for my sister-in-law's daughter and I made it all out of care bear accessories, including the diapers. It was really easy and I enjoyed doing it! This was my second cake and it was even more fun creating than the first cake. Key is to have your theme in mind and let her rip! Have Fun!!! I couldn't have completed this without the help of my mother and sister. We had such a blast!!! 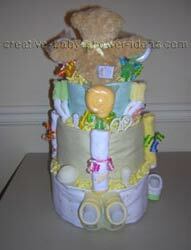 This was my first diaper cake (and cupcake) that I put together for a friend to give as a baby shower gift. I had tons of fun making it! I can't wait to make another. 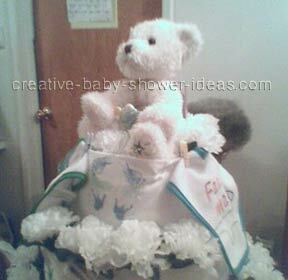 Here are some of the diaper cakes that I made for friends and family. 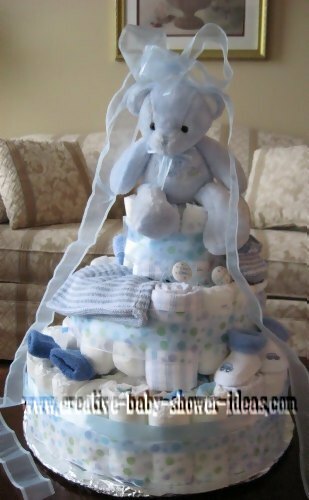 I would like to share with everyone to let them know that you can make truly amazing gifts with everyday baby items. Thank you for allowing me to post these pictures up. 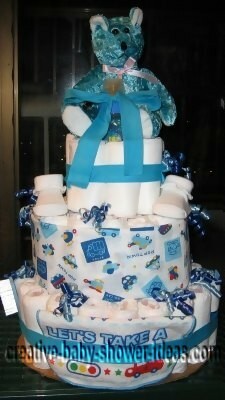 This is a 4 tier diaper cake. Inside are bibs, socks, bodysuits, and pajamas wrapped together so diapers can be formed around the bundles for security and width. 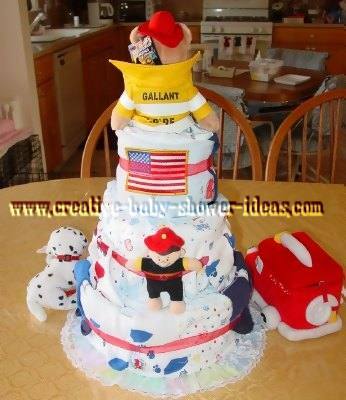 There are 100 diapers in this cake. On the outside the tiers are wrapped with homemade blankets and burp cloths. Cut silk flowers were tucked into the layers. A classic Pooh is sitting on top enjoying the flowers from above. .
We rolled the diapers tied with rubber bands and used cardboard tubing for the center's. Had 3 different size plastic plates for the tiers. 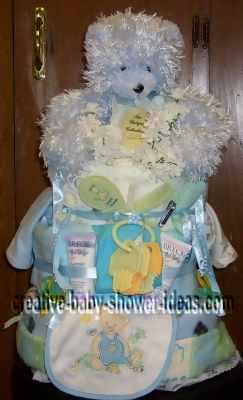 Here is one of my basic diaper cakes. It has approx. 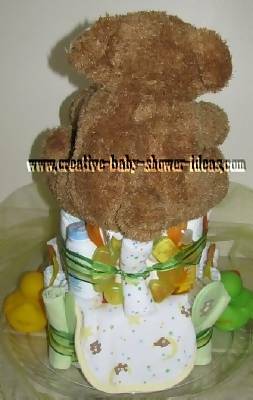 50 newborn diapers, a box of wipes and "My First Bear" perched on top. 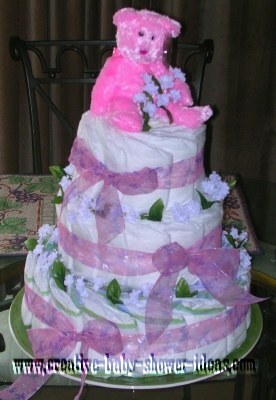 I made this cake with one pack of diapers. 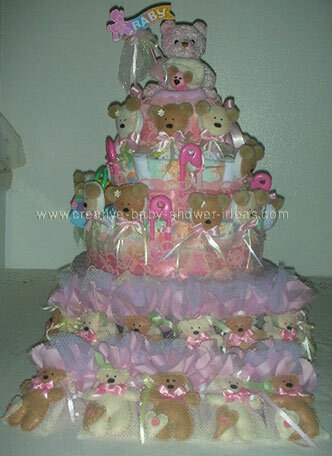 I bought all matching bear items and added them onto the cake. 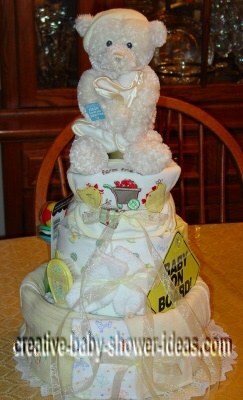 The top layer has a burp cloths wrapped around the diapers. 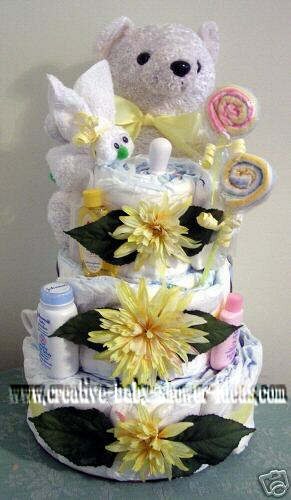 The second layer has spoons, wash cloths, and bath supplies tucked around the diapers. The third layer has wash cloths spoons and 2 bibs attached; one on the front and one on the back. 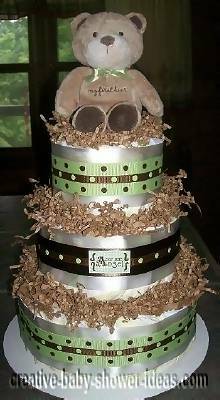 The bear is hugging the top 2 layers. Other items added are rubber duckies, teething ring and hair brush set. Platter is used for the bottom and a paper towel roll in the middle.